The recent identification of a new midge in Prairie canola crops has led researchers to revisit previous detections of what was thought to be swede midge. Boyd Mori, a research scientist with Agriculture and Agri-Food Canada (AAFC) in Saskatoon, thinks most of the suspected swede midge detections in Western Canada have likely been the new midge, which is closely related to swede midge. That’s good news, since swede midge can be a very serious canola pest, while this new midge seems to be much less harmful. But Mori and his colleagues are keeping in mind that swede midge still has the potential to become a significant threat to canola crops in Western Canada. Swede midge attacks brassica plants like canola, mustard, broccoli and cabbage. The adult is a tiny fly. The females lay their eggs on areas of active new growth on brassica plants. After the eggs hatch, the larvae feed on those growing points. Swede midge can have multiple generations in a single growing season, and the damage the larvae cause will depend in part on the plant’s growth stage when the larvae are feeding. In canola, the symptoms can include crinkled leaves, multiple branches, stunted inflorescences with few flowers, bunched-up pods (called witch’s broom) and dead plants. Yield impacts can be severe if swede midge populations are high. This insect is native to Eurasia. In Canada, it was first identified in Ontario in 2000 in brassica vegetables. Mori notes that swede midge has since spread to Quebec, New York, Vermont, Massachusetts, Connecticut, New Jersey, Prince Edward Island, Nova Scotia, Ohio, Michigan, New Hampshire and Minnesota. The first Prairie detections of swede midge were in Saskatchewan in 2007 and Manitoba in 2008. At that time, the Canadian Food Inspection Agency (CFIA) was monitoring for swede midge in Canada because it was a regulated quarantine pest. In the three Prairie provinces, the CFIA monitored nine locations using pheromone traps in canola and brassica vegetable crops from 2006 to 2008. Swede midge was found at three sites in 2007 and four in 2008. After 2008, the CFIA stopped monitoring for the midge because it was no longer a regulated pest. Since then, some pheromone trapping has been done for swede midge on the Prairies, but the insect hasn’t been found in those traps. Also, the symptoms detected in canola fields are not the classic swede midge symptoms; the symptoms are now known to be typical of the new midge, which is called the canola flower midge. If swede midge is still present on the Prairies, the population is likely very low. Mori says it is difficult to predict if swede midge will become a major pest in Western Canada. Bioclimatic modelling by AAFC researchers shows conditions on the Prairies are suitable to favourable for the pest to become established and thrive, so there is a potential threat. “The real question is whether or not we will get a large enough introduction of swede midge for the pest to actually establish itself and then continue its population cycle on the Prairies,” Mori says. He notes that swede midge is a very small insect so it probably doesn’t have a very active dispersal phase, and it would be tough for this tiny, fragile insect to fly westward because it would be flying into the prevailing westerly winds. That may sound like it would be unlikely for swede midge to invade the Prairies, until you remember that this delicate little fly managed to reach Ontario from Eurasia and to become very well established in that province. “Swede midge is really decimating canola production in Ontario,” Mori says. One of their projects is looking at resistance and susceptibility to swede midge in a wide range of host plants. The project’s long-term goal is to find some resistance traits that brassica crop breeders could use in their breeding programs. Mori is working on this four-year project with AAFC colleagues Owen Olfert and Julie Soroka. Soroka, who is now a research scientist emeritus, initiated the project in 2016. The Saskatchewan Ministry of Agriculture’s Agriculture Development Fund, SaskCanola and the Western Grains Research Foundation are funding this research. “Part of our work is looking at potential alternative hosts,” Mori says. “For instance, if breeders develop a canola cultivar that is resistant against swede midge, then what weed hosts are out there that the insect could still survive on?” Weed hosts could also be important if the weeds are actively growing very early or very late in the growing season when crop hosts aren’t available to the midge; that might allow more generations of the insect to develop each year. 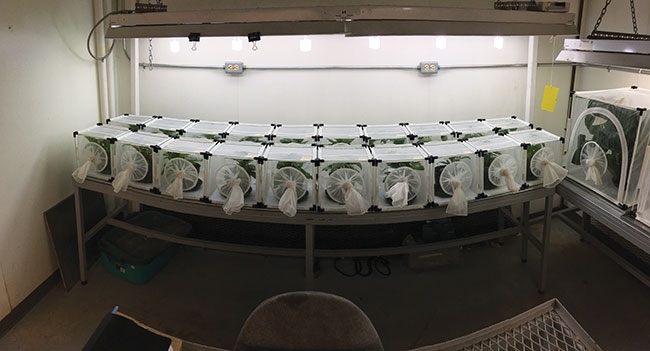 Using the swede midge colony that has been set up in the labat AAFC-Saskatoon, the researchers are conducting experiments to study the nature of the resistance/susceptibility characteristics in the different host species. “We do ‘no-choice’ experiments in which we provide a single brassica plant, and we introduce male and female swede midges. Then we look for oviposition [egg laying] and larval development on the plant,” Mori explains. “We also do ‘choice’ testing in which we provide the midges with several different plant species and then see which species they prefer and which ones they show some non-preference towards. Non-preference, or antixenosis, is when the midges prefer not to lay eggs on those plants. “We’re also looking for antibiosis. For instance, if the midges lay eggs on the plants, do they lay fewer eggs because there is some factor that is discouraging them from laying more eggs on those plants? Or maybe the larvae take much longer to develop on those plants because of some chemical factor or some resistance factor in the plant. Or maybe the larvae begin to develop and then die. Mori is involved in a study led by AAFC research scientists Martin Erlandson and Dwayne Hegedus, to investigate how swede midge feeding affects host plants on a molecular level, to see if that information might eventually lead to a way to protect host crops. “Swede midge feeding causes severe distortions and crumpling in the host plant. That is what really hampers the plant and its growth. We are not really sure whether the larva rasps at the plant material using its mouthparts or if it releases some enzymes [to turn the plant tissue into a liquid] and feeds extra-orally. So, we would like to identify the feeding mechanism and find out what is occurring both on the midge side and the plant side,” Mori explains. Mori and Olfert are part of a project team led by Rebecca Hallett at the University of Guelph and her graduate student Jenny Liu to develop a forecasting model for swede midge emergence under Ontario conditions. The hope is that Ontario growers will be able to use the forecasts for more effective management strategies, and that improved swede midge control will help limit the further spread of the pest into other canola-growing regions. In addition, Mori and his AAFC colleague Meghan Vankosky are co-leading some Prairie research involving both swede midge and canola flower midge. “We have a collaborative monitoring network with about 60 locations across the Prairies. The locations have pheromone traps for swede midge, which are monitored weekly throughout the growing season,” he says. “So far, no swede midges have been found in these traps.” As part of this project, the researchers are developing a pheromone trap for the canola flower midge; they plan to add those traps to the network. This monitoring effort is funded by the Canola Council of Canada through the Canola Agronomic Research Program, which is supported by the provincial canola grower organizations on the Prairies. The AAFC researchers are also doing some work on the natural enemies of swede midge that is linked to their parasitism research with canola flower midge. Mori explains that canola flower midge has two known parasitoids: a Gastrancistrus species and an Inostemma species. These small wasps lay their eggs in canola flower midge eggs and/or larvae. The wasp eggs hatch and the larvae develop by feeding on the midge larvae, eventually killing the midges. So, the researchers want to see if the canola flower midge’s parasitoids will also attack swede midge. “If swede midge does arrive here one day, we want to know if there might already be natural enemies present,” he says.